Blessed Trinity is currently recruiting additional docents to assist with its May Sacred Sites Open House, upcoming tours, and promotion of our unique edifice as a cultural tourism destination. The first of two volunteer training sessions will take place on Saturday afternoon, April 13, beginning at 2:30 p.m. in the parish hall located behind the church at 317 Leroy Avenue and concluding by 4 p.m. with a walking tour of the church. The date and time of the follow-up session will be scheduled to accommodate participants. You may register for the April 13 session by calling the church office at 716-833-0301 or leaving your contact information HERE. Please specify “Docent” as the Subject of your message. 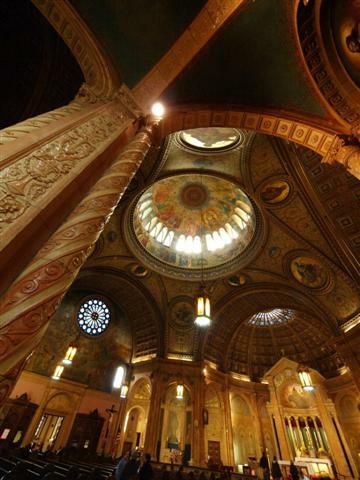 To read more about the church’s outstanding architectural features, click HERE or view “Our Beautiful House of Worship” video HERE.